Charts showing parts of the body in Spanish. Afiches mostrando las partes del cuerpo en español. Our popular Parts of the Body in Spanish chart is now available for classroom use. 1. A version where the Spanish word appears next to its corresponding part of the body. 2. Another version has a line (instead of the word) where students can write the name of the body part in Spanish next to its corresponding part. The following vocabulary appears on the main chart (31 words): antebrazo, barbilla (mentón), boca, brazo, cabeza, cadera, ceja, codo, cuello, dedo, dedo del pie, espinilla (canilla), frente, hombro, labios, mano, mejilla, muñeca, muslo, nariz, ojo, oreja, palma, pantorilla, pecho, pie, pierna, pulgar, rodilla, talón, tobillo. An article is included before the noun to help students learn whether each word is feminine or masculine. 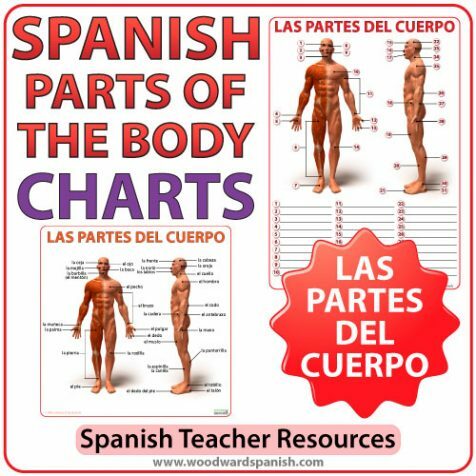 We highly recommend seeing our video about Parts of the Body in Spanish which is appropriate for classroom use and a great lead up to the worksheet. A native Spanish speaker says each word in this video. This resource is 100% in Spanish making it ideal for language immersion classrooms. It is appropriate for Spanish 1 level students of all ages (kids and adults). Las partes del cuerpo en español. 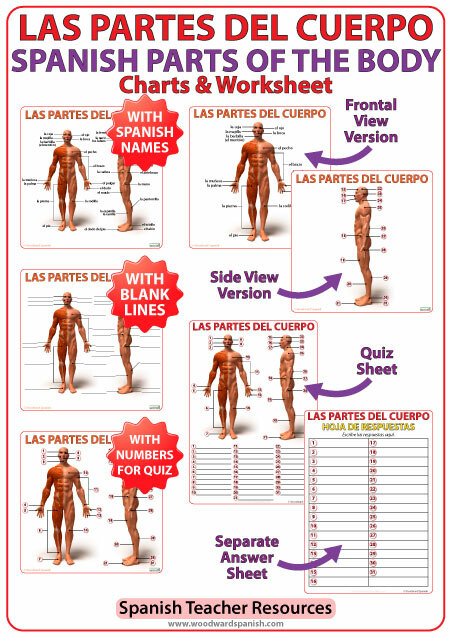 Be the first to review “Spanish Parts of the Body Charts – Partes del Cuerpo” Click here to cancel reply.